The following is an overview of most of the KwaZulu-Natal museums in South Africa by location, including descriptions, contact details and website addresses, where available. KwaZulu-Natal province's sheer physical beauty combined with a diversity of natural resources and an all-year round sunny climate make this a region well worth visiting. The warm Indian Ocean washing along the beaches makes it the winter-holiday province of the country. The Colenso (RE Stevenson) Museum, situated in the old Tollkeeper's House (1879), has many historical exhibits including a model of the Battle of Colenso. The Talana Museum is on the only battlefield in SA where buildings from the battle still exist. It incorporates an international glass museum and a national coal museum in park-like grounds. Closed: Good Friday, 25/26 Dec. The Ncome Museum and Monument Complex across the river opposite the Blood River Battlefield wagons is a memorial to the Zulu army. The Durban Natural Science Museum features displays of the Earth and its history and of life on earth both past and present, with special emphasis on the unique fauna and flora of South Africa. The Geology Education Museum focuses on an introduction to minerals, rocks and fossils, as well as structural and economic geology, and the geology of KwaZulu-Natal. The KwaMuhle Museum offers an exciting programme of exhibitions, workshops, cultural events, videos and educational tours portraying the vibrant history and culture of 20th century Durban and KwaZulu-Natal. The Old Court House Museum portrays the rich history of early Durban and KwaZulu- Natal through fascinating replicas of Durban's early settlements. The Old House Museum, a typical veranda house, with its notable architecture and fascinating articles of old furniture and fittings, depicts the life-style of Durban's Victorian settlers. The Port Natal Maritime Museum portrays aspects of the maritime history of Durban and KwaZulu-Natal. Highlights are three large multi-ton vessels and smaller craft and the Brittania room, with its interactive and creative displays and videos. The Warrior's Gate MOTH Museum is a rich collection of militaria focusing on South African involvement in the two World Wars. The Vukani Museum exhibits a collection of Zulu arts and crafts collected from the region over a period of time. Kwabhekithunga is a traditional Zulu uMuzi (village). The Zululand Historical Museum, set in an old fort, displays Zulu cultural items and information on the early Norwegian missionaries. Fort Durnford, housed in the beautiful imposing, military fort designed by Colonel Anthony Durnford and built by Mr Jeromia Faulds (1874), contains exhibits on military history, fossils, bird eggs, the Moorleigh mission station and an Amangwe homestead. The Greytown Museum, a historical monument, with a giant fig tree planted by former Prime Minister General Louis Botha' s sister, is crammed with items from a variety of cultures. It specialises in the Bambatha Rebellion. The thematic displays at the Mission House Museum depict the arrival of the first missionaries and tradesmen in Natal (1854) sent out by the Hermannsburg Mission Society in Germany, and of German settlers who followed soon after. The Himeville Museum is in a fort that was originally built for the protection of local settlers and was subsequently a prison for 70 years. The rich history of the district is reflected in the buildings and artefacts on display. Dumazulu Traditional Village is a living museum where manufacturing traditions and Zulu dancing are demonstrated. The evocative Isandlwana Historic Reserve and Battlefield depicts the most famous battle of the Anglo-Zulu Wars. The East Griqualand Museum has exhibitions on Griqua history, concentrating on the Griqua trek from Phillipolis to Kokstad and the establishment of the town of Kokstad. The world renowned Ladysmith Siege Museum depicts the events leading up to the siege and the siege itself through photographs, relics and a diorama. 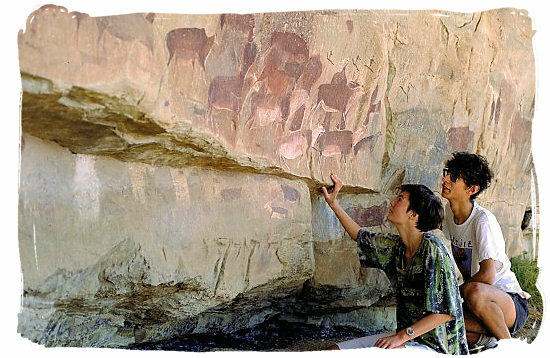 The Matatiele Museum has exhibits on local prehistory and on the history and cultures of the town and district from the Stone Age to the present. The Mgungundlovu Museum is on the site of King Dingane's headquarters. Extensive archaeological research has been carried out and huts reconstructed. The Pinetown Museum is a multi-cultural local history collection representing all the country's cultures. The arrangement is chronological, depicting local history from 100,000 years ago to the present. The Macrorie House Museum contains a comprehensive collection of Victoriana and Ecclesiastica housed in Bishop Macrorie's original double-story home. Within the house is a miniature chapel (complete with ghosts). The Natal Museum is home to one of South Africa's great national collections. A popular tourist and educational amenity and an acclaimed centre of scholarly research, it offers a feast of attractive, user-friendly displays. Exhibitions feature a wealth of animal life, bushman rock art, a marine gallery, African cultural products, settler history and much more. The Voortrekker Museum consists of the Church of the Vow and Andries Pretorius House. Exhibitions feature the Great Trek and the interaction between the Trekkers and the people with whom they came in contact. The largely maritime exhibit at the Port Shepstone Museum focuses on the early years of Port Shepstone when the harbour played an integral part in the development of Southern Natal and East Griqualand. There is a shipwreck display and a map of shipwreck sites. The Rorke's Drift Museum is in a rural setting about 45km from the nearest town (Dundee). It is designed to give visitors a thorough introduction to the Zulu wars, while focusing specifically on the defence of Rorke's Drift. The unique Comrades Marathon Museum depicts the history of this legendary race and celebrates the great athletes who have enhanced its international reputation. The KwaZulu Cultural Museum houses displays of archaeology and Zulu culture. A site museum focuses on Ondini (King Cetshwayo's residence) and on the history of the Anglo-Zulu War. The Vryheid Museum consists of the Nieuwe Republiek Museum (council chambers with fort and jail), the old Carnegie Library (local history), and Lukas Meijer House (a period house museum with exhibits). The Weenen Museum, a Voortrekker museum in a Voortrekker town, houses a display of old Voortrekker utensils, dresses, and so on in a building dating back to the 1840s. The Winterton Museum, which has an excellent library on the Anglo-Boer War, also features local history and an Amazizi replica homestead and agricultural implements.